Ever wanted to experiment with pinhole photography, but didn’t know where to begin? Didn’t want to spend the cash on one of those sweet looking wooden ones? Well for a couple of dollars you can make one that works just as well. I first came across this type of pinhole while browsing ebay. Some people try to sell these things for $20 or more, HAAA. Don’t get duped, make one yourself. They only cost a few bucks to make and it only takes about 20 minutes. 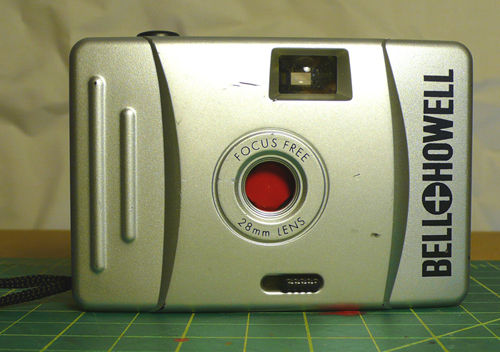 A super simple, bare bones plastic point and shoot camera, no flash, no nothing. Mine is a Bell + Howell that I paid $1 for at a thrift store. First thing’s first. You’ll have to drink the Coke relatively quickly, you’ll need the can in a few minutes. Let’s get started. 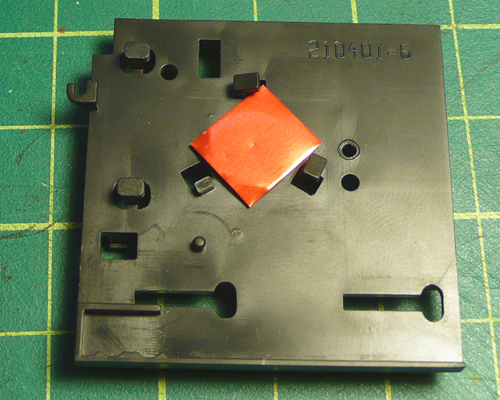 You have to remove the camera’s skin, it’s outer face plate. To do this remove the appropriate screws and place them in the empty film canister so you don’t knock them off the table. On the best, cheapest cameras there are usually four of them. The first two can be found near the camera back’s hinge found on the side of the camera. Open up the camera look underneath where you put the film cassette, there will probably be two screws in there somewhere. Again, there may be more, but if there are many more you chose the wrong camera. The cheapest cameras usually only have the four. Now that the screws are out pull the camera’s face off, it should kinda just fall off. The picture below shows what it looks like. Now the fun begins. We have some peices to pull apart and others that we have to modify. Don’t leave! It’s super easy, I promise. You have to pull three parts off, the little slider thing that opens and closes the lens cap, the lens cap, and the shutter bar thing. *Note if the Spring flies off the camera while your removing the shutter bar thing, don’t worry you won’t need it. 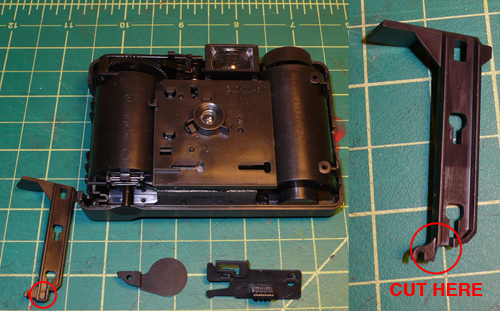 Once the shutter bar thing is removed you’ll have to cut a small chunk of it off with your hobby knife. See the picture below. 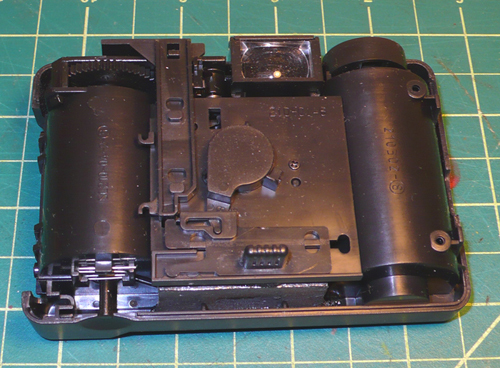 The piece has to be removed to allow you to press the shutter when the lens cover is in use. I have circled the area that has to be cut. Notice the difference in the bottom right corner of the shutter piece. Next you’ll have to pull the lens plate off. There will be a screw on it somewhere, find it and unscrew it. Remember to put the screw into the film canister that now contains four other screws. Now that that’s off you’ll have to do two things. Pop the lens out of the lens plate with your screwdriver, chances are it’s plastic so it won’t shatter it’ll just break or fall out. You’ll also have to pull the shutter off and the spring that’s attached to it, you won’t need these anymore so you can throw them out or do whatever you want with them. Next you’ll have to make the pinhole. Cut a small square or rectangle out of your Coke can (hopefully you’ve finished it by now), it should be a little more than a 1cm square, accuracy isn’t that important though. Keep in mind though that you’re better off having one that’s a little too big than having one that’s too small. Once it’s cut, place it over the top of the hole where the lens used to be to make sure it’s big enough. Pick where the center mark will be and tap the needle into it, do not poke the needle all the way through, you’re pinhole will be too big. Turn the metal over, you will notice a slight bump. Pull out that sandpaper and sand that bump off, there’s you’re pinhole. Look how small and nice it is. Once you’ve got it right place it on top of the spot where the lens was again. Line it up by holding it up to a light. Find the right spot and super glue it down. 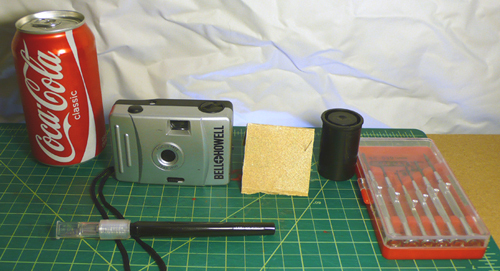 Don’t worry if you make a mistake you can always rip it off later and make another pinhole. The camera is essentially finished now. 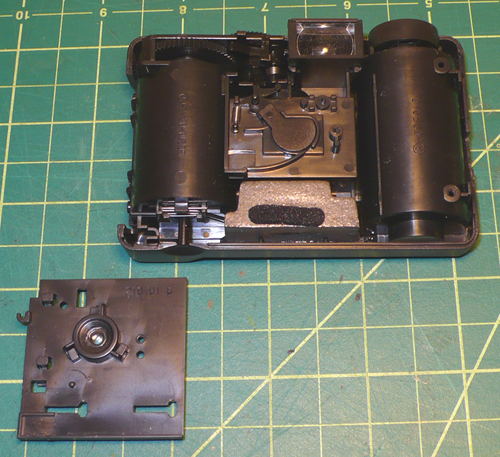 All you have to do is put it back together in reverse order, load it with film and fire away. If you have a super tiny pinhole it will probably take up to ten seconds to get a really good exposure, but play around with it, you won’t know for sure until you’ve shot a few rolls with it. Now you may be saying, “great I made it, but how do I use it?” Great question, it’s quite simple really. The old lens cover is now your shutter. To make an exposure place the camera on a steady object. like a tripod and open the lens cover. To advance to the next frame, close the lens cover and press the shutter release button, wind the film. Repeat as desired. That’s it, have fun with your new camera. This entry was posted on 1 March 2009 at 6:33 pm and is filed under Tutorials. You can follow any responses to this entry through the RSS 2.0 feed. [WORDPRESS HASHCASH] The comment’s server IP (208.109.181.209) doesn’t match the comment’s URL host IP () and so is spam.